If you’re a college student, you might find that life is a little more hectic than in your high school days. This is especially true if you’re paying for an apartment at the same time and you have to work. 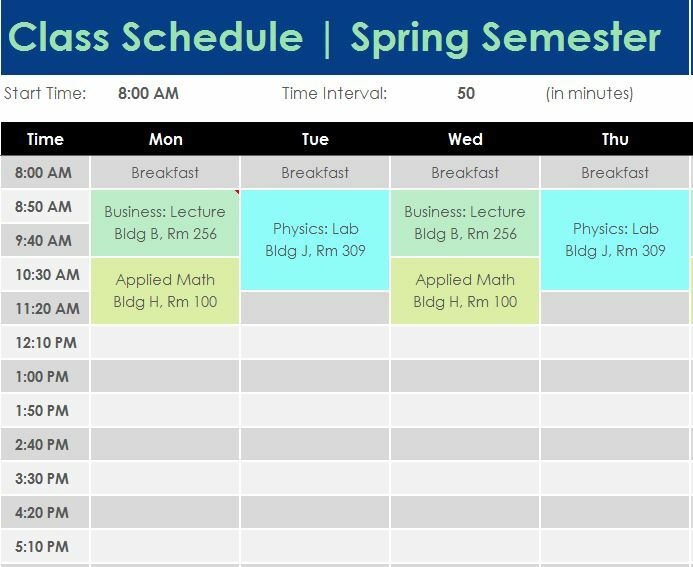 The free Class Schedule is a tool that allows students to put down all their classes on one convenient page. You can use this table to make sure you have everything you need to succeed this semester. One of the biggest fears that college freshmen have is failing a class because they weren’t organized. It costs you thousands to take that class and not passing is a total nightmare. You can start to rest easy with this free document at your side. To download the free document to your computer, scroll to the bottom of this page and click the link below. This will download the template to your computer. Once you have the sheet, you can feel free to start entering your class schedule. To do this, you will enter the start time for your first class of the day and then enter the duration of each of your classes at the top (in minutes). When you have that down, you can proceed to the table below. There are plenty of examples to get you started. Simply go through the times and days and enter your own classes and information. You will include the subject, the building, and the room number so you know exactly where to go. When you have gone through and entered all the information for your classes, you can save the document by going to “File” above and choosing the “Save as” option. This way, you’ll always have a digital copy of your class schedule wherever you go.